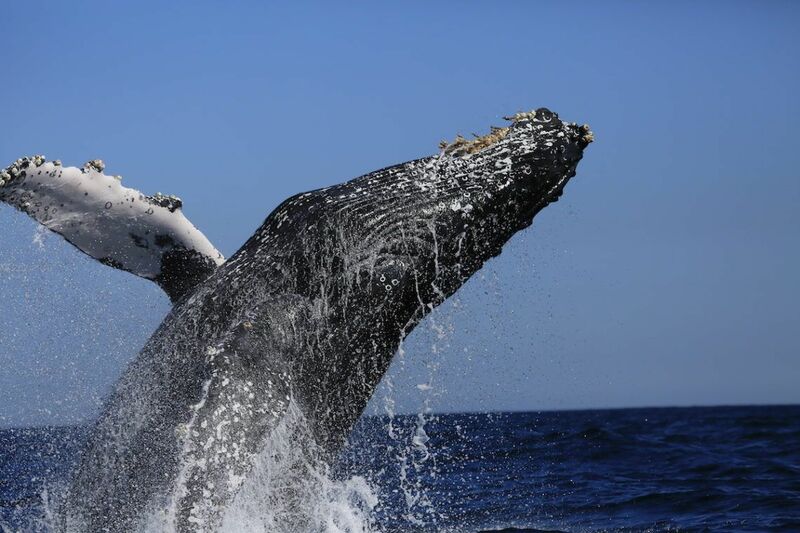 Every year during the winter months of November through April, Los Cabos and the Sea of Cortez welcome the return of an abundance of whales at the conclusion of their migration from the icy waters of the Bearing Sea and vicinity. They arrive to the warmer waters of their natural habitat to breed and calve here in our backyard. Locals and tourists enjoy this annual experience by watching these gentle behemoths as they feed and frolic in the waters offshore. Hundreds of California gray, blue and humpback whales, among other species, charm and amaze us with their playfulness. The breaching, slapping and sounding that garners such attention and excitement is considered to be a part of the annual mating rituals. Living in our terrestrial environment, witnessing the enormity of these majestic marine mammals is both humbling and awe-inspiring. The blue whale, the earth’s largest creature, extends beyond 90 feet in length and can comprise a mass of 200 tons. Considerably smaller, yet still leviathan in nature when compared to humans, the California gray and humpback whales reach typical lengths of up to 50 feet with weights in excess of 40 tons. All three species are baleen whales with large plates of keratinous material, similar to human fingernails, lining the upper jaw which act like a strainer as they feed. Baleen whales capture their food by swimming with their mouths open while using their baleen bristles to filter large amounts of fish, krill, shrimp and various crustaceans from the water. They then expel the water out of their mouth while leaving their prey stuck in the baleen bristles. Thousands flock to local excursions to enjoy whale watching from boats, large and small, floating alongside a group of whales. These activities provide the once in a lifetime experience of not only seeing, but touching, rubbing or even kissing, one or more of these amazing giants. For some, observation from shore can create as great a thrill. We at 2Seas Los Cabos, the exclusive Baja California affiliate of Christies International Real Estate, can provide you this daily whale watching experience surrounded by the luxurious comfort of your own home. Both visually and architecturally superlative in every way, this mountaintop home combines vast, open living spaces, intimate gathering and entertainment areas, interior gardens, and 6 splendidly private sleeping quarters, with 6-and-one-half luxurious baths in just under 6000 interior sq. feet of cool, sunlit contemporary magnificence. This home features more amazing luxury and technological details than can be listed. Casa Ventana al Cielo boasts fabulous expanses of casually crisp and elegant décor, designed to be experienced and enjoyed throughout. If a beachfront condominium is more your style, La Residencia at Costa Azul is an exceptional opportunity. A small enclave of only thirteen luxury residences, features panoramic sea views from Palmilla to Punta Gorda, and beautifully designed living spaces just above the sand. You can enjoy whale watching from the spacious balconies of La Residencia A2 and La Residencia B4, as well as the Penthouse, all units with wide open indoor spaces and outdoor living terraces on the sea side make this unit a beach-lover’s paradise with full resort amenities that even include a private fitness center, activities room and seaside pool above the waves. Only minutes from the San José International airport to feet in the sand on one of Los Cabos’ prime beaches or watching whales breach in the Sea of Cortez from your balcony. With forever views from Palmilla Point to Punta Gorda from every room and terrace, Tortuga Bay Penthouse #601 features superbly tasteful traditional and artisan finishes and materials. Boasting supreme privacy and luxe living/playing, Casa Bella Vista is located right at water’s edge, featuring 4 bedroom, 4 1/2 bath home of baronial scale. Grand double-height living area opens seamlessly to expansive outdoor lounge and private pool area by the sea. Glorious Mediterranean-style details provide a perfect canvas for custom décor, while the home’s elevator offers easy access to upper level quarters. Whale watching in Los Cabos is a major attraction offering incredible opportunities to witness these majestic creatures up close or from afar. We at 2Seas Los Cabos, your local affiliate for Christie’s International Real Estate, will help you find the property you most prefer allowing you to watch the whales from the comfort of your own luxurious home.